MuPDF, a free, open-source, and lightweight PDF and XPS viewer, now reaches the 1.8 release with new features, improvements and various fixes. 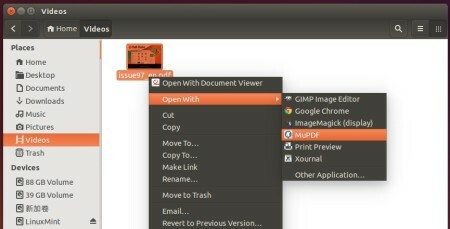 MuPDF is a lightweight PDF viewer and toolkit written in portable C, which also reads XPS, OpenXPS and EPUB documents. It works on Windows, Android, and Linux. New OpenGL-based barebones desktop viewer. In addition, mudraw has been merged into mutool, use mutool draw to use mudraw. There are Android, Windows installers, and source tarball available in its official download page. For Ubuntu and derivatives, you can either build the viewer from the source or use my personal binaries in PPA. Finally click install the packages via Ubuntu Software Center. The PDF viewer doesn’t have a launcher. To use it, right-click on the file and select it from the “Open With” option. To set default, go to file’s context menu -> Properties -> Open With tab -> select MuPDF from list -> finally click ‘Set as default’ button. For mouse behavior and key bindings run man mupdf command in terminal. You may remove the PPA by launching Software & Updates and then navigate to Other Software tab. Also remove MuPDF via Ubuntu Software Center if you want. It’s quite surprising that ppa above only offers mupdf which according to developers will be deprecated soon. Why not package mupdf-gl?